Stop Leaf Septoria (Yellow Leaf Spot) in Its Tracks! Sometimes called "yellow leaf spot" or "leaf septoria," this condition is caused by a fungus (or sometimes a bacteria) that attacks cannabis plants and usually appears in warm, wet weather. The symptoms first appear on the bottom leaves of the plant. The spots may have darkened borders and may have a hard growth in the middle like a little pimple, but the thing that makes the spots the most unique is they are often very uniform, like little circles. Each spot is the receptacle of a spore (ewwww) which look like tiny dark specks in the center of each spot. Although the spots often appear yellow like in the picture below, they will start turning brown over time. 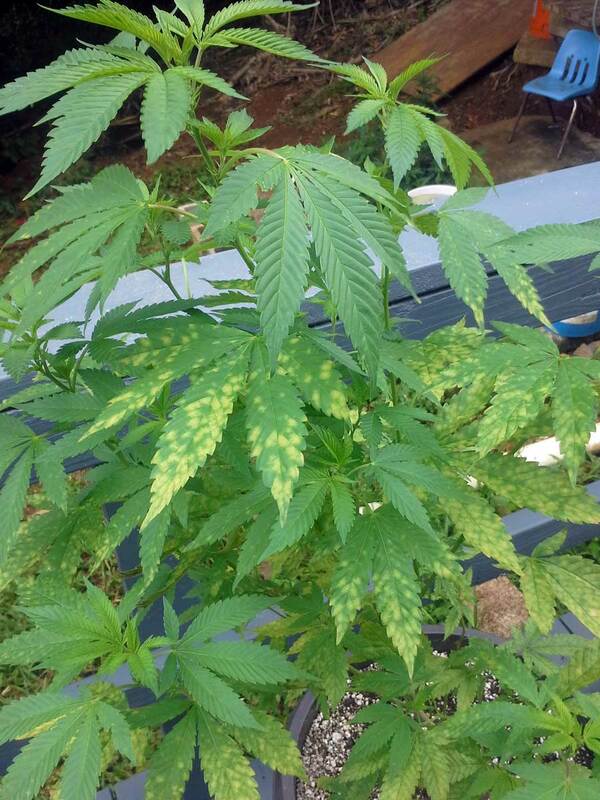 So if you see round brown spots on your cannabis leaves it could also be caused by leaf septoria. This fungus spores may stay in the soil over the winter, and attack your plants in the summer. Spores are also easily spread by wind and rain. Immediately (and carefully) remove all affected leaves to get rid of as many spores as possible. Make sure to keep the ground under your plant clean. Rake away all leaves and vegetation. Adding mulch can also help prevent spores from spreading. One way to help prevent this fungus from attacking your plants is to rotate crop sites or move to a new location every year. A copper based fungicide or a broad spectrum fungicide may be effective at stopping the fungus from spreading though they are best used as a preventative. Depending on exactly what's causing your leaf spot, Neem Oil may be used to help combat the problem. Neem Oil will leave an unpleasant taste/smell on buds when used to treat flowering plants, so don't let this stuff get near your buds! You will need a mister (also called a "One-Hand Pressure Sprayer") to spray all the leaves evenly, since neem oil and water can separate easily. Try spraying just a small part of the plant and see how it reacts first before spraying the whole thing.